I’ve seen many ways to help students understand prepositions and I have come to the conclusion that EnglishClub does it the best! Jane is waiting for you at the bus stop. The shop is at the end of the street. My plane stopped at Dubai and Hanoi and arrived in Bangkok two hours late. When will you arrive at the office? I have a meeting in New York. Jupiter is in the Solar System. The author’s name is on the cover of the book. There are no prices on this menu. You are standing on my foot. There was a “no smoking” sign on the wall. I live on the 7th floor at 21 Oxford Street in London. I've seen many ways to help students understand prepositions and I have come to the conclusion that EnglishClub does it the best! I have a meeting at 9am. The shop closes at midnight. Jane went home at lunchtime. In England, it often snows in December. Do you think we will go to Jupiter in the future? There should be a lot of progress in the next century. Do you work on Mondays? Her birthday is on 20 November. Where will you be on New Year's Day? at the weekend* I don't usually work at the weekend. at present He's not home at present. Try later. When we say last, next, every, this we do not also use at, in, on. Fill in the blank. Now honestly, how many people had flashbacks of their school days when one was handed a test with such a section? With the rise of tablets and smartphones, no longer are people required to fall back into the era of pen and paper to practice their English grammar skills. Whip out your smartphones or tablets if you want to spend some time with grammar, for boring paper and pencil sentence construction has just become fun and interactive on a palm sized plastic machine with a couple of wirings inside. First off the bat, we have LearnEnglish Grammar by British Council. The grammar app pulls us back to the school benches with its questions in three categories of difficulty level (Elementary, Intermediate, and Advanced). 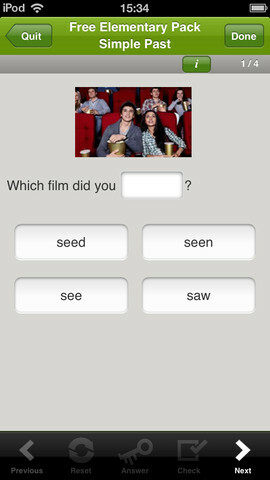 Questions can be asked in many forms, thus the app will not get monotone. Some forms of questions are filling in the blank, rearrange the words, and point out the mistake. What is also quite interesting is that the app is capable of dividing specific grammar usage into different categories, as shown in the picture. The application is available on iOS, Android, and Blackberry through each of their own respective stores for $0.99/ pack. There are 9 packs. Compactness is not everything. Some people want powerful applications with bucket loads of content. 1800 Grammar Test, by Triet Ho, is one of those hours on hours of the monotonous question solving apps where one can almost never run out of questions. So how does this work? The app gives you five questions per test. You fill out these grammar questions, and when you score a perfect score… nothing happens. You move on to the next test page, and then the next, and then the next, and then you realize you are about to scratch your eyes out due to hours and hours of multiple-choice questions. The grammar app has no loading screen, but that is not good news once you realize you are trapped and addicted into endlessly repeating multiple-choice tests. The only feature this app is missing is a huge red button that says, “In case of seizure, please press me!” then it calls the ambulance, as you collapse on the floor with perfect English grammar knowledge from days and nights of multiple-choice questions. The application is available on iOS, Android, and Blackberry through each of their own respective stores for free. English Grammar In Use, by Cambridge University Press, app also earn a mention. 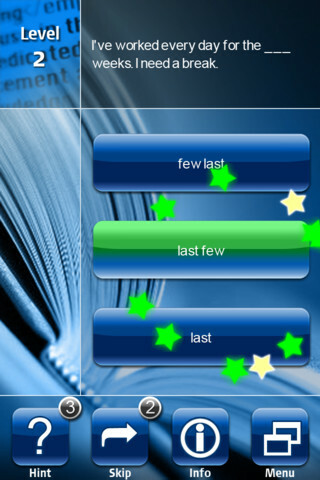 It is a compact yet extensive grammar-building app. It has all the pros from the above mentioned apps, LearnEnglish Grammar and 1800 Grammar Test, as it encompasses the compactness and refined mechanics of LearnEnglish Grammar yet has a large set of questions like 1800 Grammar Test. In short, the app English Grammar In Use, is like 1800 Grammar Test without the consequences of collapsing on the floor with a foaming mouth and horror-struck pupils. It has hours of content, yet it delivers it in such a way that is not monotone. Different types of questions, the option of skipping or asking for a hint, progress tracking, and even high score mechanisms integrated into it (and who said learning can’t be made into a competitive game). The application is available on iOS, Android, and Blackberry through each of their own respective stores for $4.99. A little bonus application, again from British Council, LearnEnglish for Taxi Drivers can be used for the prudent student that wants to master English Grammar. The app itself is not intended for such use, but it is still viable. When your English grammatical skills become better than that of a stereotype immigrant taxi driver, you know you are well on your way to be both terrific and prolific with your English grammar. The application is available on iOS, Android, and Blackberry through each of their own respective stores for $1.99. YouTube is an AMAZING tool for language learners! YouTube combines visuals and audio to really stimulate the senses. Much more entertaining than the standard old grammar book! Spend sometime and find the channels that you like. When you find a channel that you really like, click on subscribe. Every time you are on your YouTube homepage, videos from the channels that you subscribe to will be featured. As with learning anything, practice makes perfect. The more you hear English, the more you are going to understand it. Listen to a video and repeat what you hear. Try to mimic the sounds that you are hearing perfectly. I tell my students to repeat what they hear and look in the mirror. Beginner tip! If you are a beginner, search for videos in your native language and turn on English subtitles. Try this out and then move on to videos with English audio and English subtitles. For many of us, the start of the new year is the time we often dust off our language dictionaries and workbooks and resolve to learn a new language. We conjure up dreams of communicating seamlessly with locals during our next trip and impressing our friends with newfound skills. But most of the time, as we get caught up in work and life, our plans get shelved along with our books. But the truth is, learning a language shouldn’t be a chore. After all, reading, listening and chatting with others are all great, enjoyable activities and learning should be, too. And it also can be easy—if you approach it in a fresh way. So put down the books, and try one of these other ways of learning a new language. You’ll have the basics down pat before your next trip. When you start to learn a language, approach it through the eyes of a child. Children’s books and learning materials start with the basics and break them down into small fragments—and when you’re pressed for time, that can be much easier than getting into a dense workbook. When I first started learning Korean, I learned my numbers in 10 minutes with theKorean Numbers Song. Later, I used children’s books and music videos to help gauge when I was ready to move past an introductory level. When I got to Korea, I gained confidence by speaking to nieces and younger students—they understood my basic words, and I wasn’t so worried about messing up. These conversations gave me the foundation to learn “formal” Korean later. Before I left for India, I got to know the three Khans—Shurukh, Salman, and Aamir—three of the most popular Bollywood Stars of our time. I immersed myself in their movies and songs, which not only made my ear familiar with the inflection and sounds of Hindi language, but also helped me learn a few basic phrases. Of course, my first words in Hindi, “Tere naam le ke” (my heart takes your name) didn’t really help me order food or get around Mumbai efficiently. But, because I understood how real Hindi is spoken, as I learned the language, I ended up speaking it fluidly instead of like a robot (as I might from one of those audio-lessons). I also got to bond with my host family about the movies I had seen and the music I liked. In Thailand and Japan, I learned a lot of basic phrases by studying karaoke songs—and even performing them. While it was embarrassing at first, it did help me practice my language, and also prepare for business situations (where karaoke is a common networking event). Instead of reading about the local market in your language text, why not just go there? Visit the Chinatown, Koreatown or other ethnic neighborhood in your city at home and talk with people to practice numbers, basic words and phrases and polite formalities. You will often find that vendors (especially in the U.S.) are always happy to chat and even happier to help correct language mistakes. It’s a great place to practice a lot of conversation in a short amount of time. There’s no need to invest in expensive software when there are so many free resources and apps out there. With a few downloads and apps, you can get daily updates and lessons, speak with a native over Skype or have Google hangouts with people who are also learning. Check out Italki to talk to natives and receive tutoring, Hindipod (for Hindi), andTalk to me in Korean, which has downloadable podcasts and shows. You can also get one-on-one attention with teachers and tutors on some of these sites. In addition, the BBC has great language-learning guides, which offer insight into culture and everyday life in other countries. The only way language will stick is by speaking and listening often, so take any opportunity you can find to use another language. Talk to friends from other countries, try out an ethnic restaurant and speak to the owners in their language or join meet-ups of like-minded language learners. Learning a language doesn’t have to be a resolution that gets tabled again—it can be something to embrace in a fun new way. So as you prepare to travel to a new country this year, don’t be afraid to dive into the language. You may not become fluent, but knowing a little bit will go a long way.